Described as a "must see" destination winery, Hernder Estate Wines is known as much for aesthetical appeal as it is for it's award winning wines. Since opening in 1993 with only one varietal, Hernder Estate Wines has over 25 award-winning VQA, fruit wines, late harvest, and Icewines. Open 7 days a week year-round, we offer tastings daily and public tours on the weekends at 1 pm. A self-proclaimed wedding winery, the property is a rare find for brides and grooms all over the world. Ceremonies on-site paired with two different reception rooms, both with fireplaces, equals the convenience of having everything in one location. 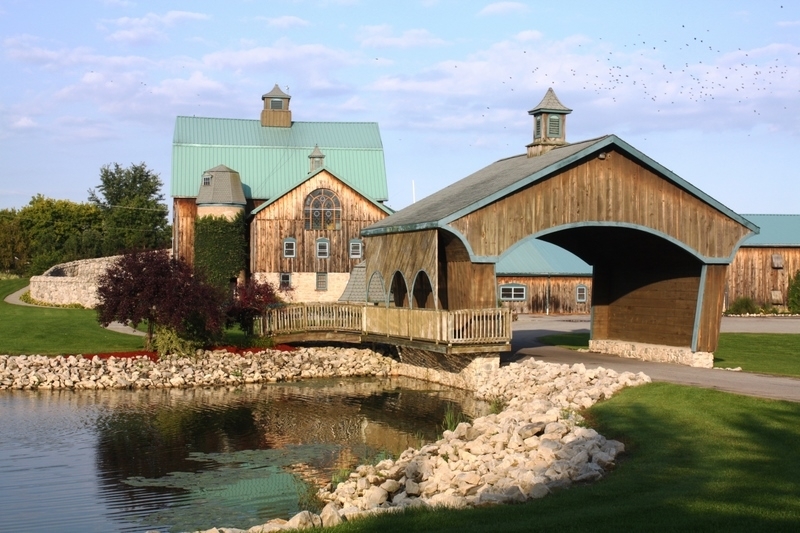 Niagara's only covered bridge welcomes guests to the historical Victorian barn, circa 1867. A pond with a fountain furthers the picturesque setting, accounting for the property's magnetic appeal (packages available on our website complete with pricing). Niagara Vinegar is also housed in Hernder's retail store, along with grapeseed oil, reductions, bread dippers, homemade jelly and Icewine jelly.